Vehicle sharing has been around in some form for a long time, and now technology and demand have laid the foundation for a new service platform: Vehicle as a Service (VaaS). In urban areas where vehicles are used mainly for short trips, car and ride sharing subscription services use mobile apps to provide easy scheduling and access to vehicles. As consumers become more comfortable with the idea of treating a vehicle as a service rather than a possession, the car-sharing market is likely to grow, and new service models will spring up to address needs that are not adequately handled today. For example, car sharing services don’t yet make it easy to make a one-way trip, or to keep a car for weeks at a time when needed. One efficient form of Vehicle-as-a-Service does already exist: long-term rental and courtesy vehicles, which often come with upgradeable services such as maintenance reminders, service-on-request, and emergency response. When this model works, it really works—the advantages to the consumer are clear and tangible. For a fixed monthly price, you can have reliable usage-based access to a car with little or no upfront cost. Want a different car every day? You can have that, without worrying about maintenance, registration, financing or the other burdens of car ownership. You will be able to tailor your subscription plan to your budget and needs right from your smartphone. There are a few challenges to overcome on the way to VaaS nirvana. When you don’t own the car, you have to change the way you think about it. You can’t just leave your stuff in it, and of course you won’t be expressing yourself with bumper stickers. More importantly, consumers might worry that it will be hard to get access to a car during peak demand times. VaaS service providers will need to think through what service level agreement (SLA) they can offer. Self-driving cars add an interesting dimension to the VaaS platform model. For people who can’t drive, the autonomous vehicles as a service will provide new mobility options whether young, old, disabled or never obtained a license. In addition, according to an article by Computerworld, autonomous vehicles are likely to provide mobility at a lower cost than taxi service and ride sharing. Delivering packages or items autonomously will open up new kinds of convenience and spark new business models. With all these VaaS applications, vehicles become part of the larger Mobility-As-As-Service (MaaS) movement that focuses on making it seamless for people and goods to move from place to place that is most convenient and efficient. To make VaaS work, the automobile is not only as a connected machine in the fourth industrial revolution, but also a service platform. The automotive experience in the near future might have more to do with which features are enabled in an app than with the car hardware itself. Many of the features required are already built into cars or available as aftermarket additions. Vehicles enabled with telematics provide a better experience through real-time access to vehicle location and availability, mileage, fuel consumption and maintenance data as well as powering emergency response, stolen vehicle recovery and overall enhanced customer engagement. 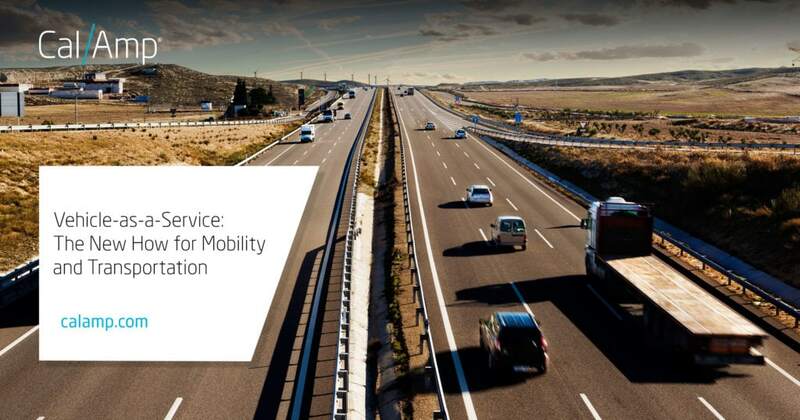 To learn more about how CalAmp is enabling The New How of transportation and mobility, visit our solution page: calamp.com/solutions/automotive-iot.or visit us at Mobile World Congress in Hall 8.1, Booth# B71.